A facility in central Wisconsin was decimated by severe water damage after melting snow on the roof backed up through the shingles due to an ice dam. The ice dams had to be removed before any repairs to the inside of the building could be completed. Removing the dams consisted of an invasive procedure of steaming and scraping the entire roof which ultimately cost almost $6,000. Once the ice dams were removed, repairs were made to the roof, gutters, drywall, and other fixtures. Total damage was in excess of $90,000. Ice damming costs businesses and homeowners thousands of dollars every year. If a poorly insulated structure isn’t addressed in a timely manner, it may be necessary to completely replace the roof, insulation, drywall, hardwood floors, and other furnishings. An ice dam occurs when snow accumulates on a poorly designed roof. Warmth from inside the building heats the roof and melts the bottom layers of snow. As the image below shows, snow melts along the entire roof, except at the eaves or gutters. The melted snow subsequently pools along the eave and in the gutter. The standing water eventually freezes and creates a dam. Icicles will often begin to form along the gutter which is an early indication of potential damming problems. Future water runoff will hit this ice dam and push up through the shingles and possibly into the building. As is the case with so many of the claims West Bend handles each year, preventing ice damming in the first place is much more cost effective than dealing with the consequences later. Consider the following steps – which have been listed in order of priority – to prevent ice dams from forming on your roof. 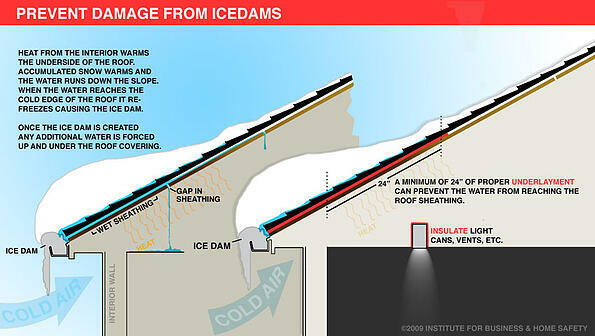 Remember, ice damming is not a problem that will just go away; if a roof had ice dams last winter it will dam every winter after unless these steps are taken. Remove or relocate any heat sources installed in open areas directly under the roof, such as an attic or mechanical room. Remember, the temperature of the roof and attic should be the same as the outside temperature. If the overhang is cold, yet the temperature of the roof is warm, the snow will melt and create an ice dam at the eave. Check the seals on attic hatches. Heat from the building will seep through poorly-sealed openings and warm the areas directly under the roof. Foil-faced foam board held together with aluminum tape should do a sufficient job of insulating these areas. Make sure the ducts connected to kitchens, bathrooms, and dryer vents all lead outdoors through either the walls or the top of the roof. These ducts should never lead through the underside of the roof as this will contribute to ice damming. Add additional insulation on the attic floor to keep heat from reaching the bottom of the roof. Check with a contractor to determine the appropriate level of insulation for your facility. Recessed light fixtures can release tremendous amounts of heat into the attic if not properly insulated. If light from these fixtures is visible in the attic, the insulation is insufficient. Beware, however, as older recessed lights cannot be insulated without creating a fire hazard. Check with the manufacturer before proceeding. Any penetrations into the attic, such as partition walls or chimneys, should be thoroughly sealed and insulated. Again, if light can be seen around these areas from the attic, more insulation is needed. Immediate steps can be taken to minimize short-term damage if ice dams have already begun to form on the roof. 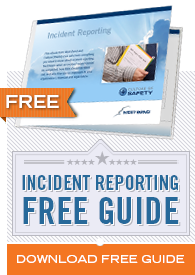 Note however, the loss prevention recommendations above should be followed for long-term cost savings. Contract with a reputable contractor with certificates of insurance to remove snow from the roof as doing so can be extremely dangerous. Reducing the exposure of a serious injury or permanent damage to the roof through a contractual agreement is highly recommended. If all of the snow is removed quickly, there won’t be any liquid to cause damming in the eaves and gutters. Some steps can be taken in an emergency situation where water has already begun flowing into the structure. Making channels through the ice dam allows water to drain off of the roof. Again, contracting with a professional is highly recommended for this type of job. If a major roofing project is planned, ask the contractor for “ice guard”. Ice guard is a protective layer added underneath the shingles to prevent water from seeping through. Ice dams will still form if the heat distribution is poor, but the guard will mitigate damage to the interior of the structure.